Thanks to everyone who gave suggestions for quilting with kids. 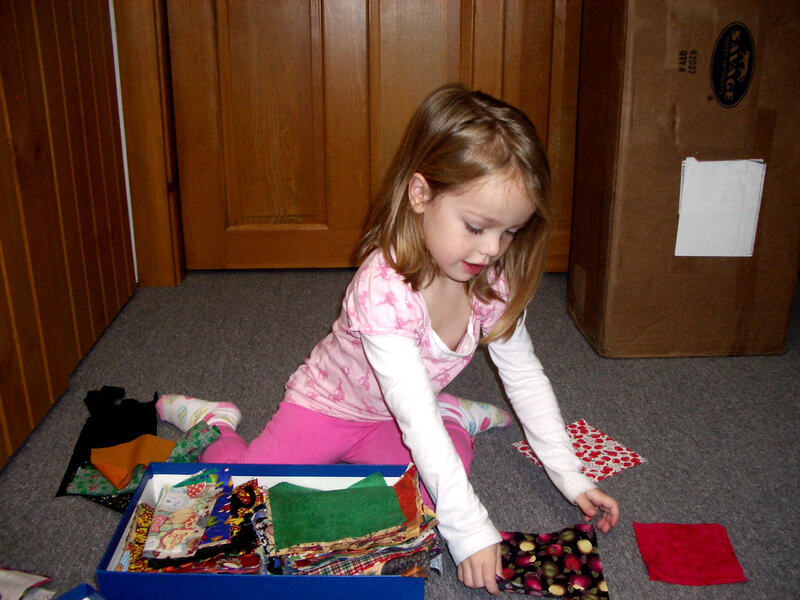 I decided the best way to start with Hanna was to open up my box of 6″ squares (from various exchanges) and watch her reaction. She had to feel every square. She’s really grandma’s girl :-). She chose her favorite 12 and they were mostly Christmas prints. I then set my featherweight up on a bench, with Hanna on a stool and she was off. She listened carefully and did just as I instructed. I was very pleased and impressed. It was hard for her to step on the pedal with the ball of her foot, but her heel worked great! She drove and grandma helped guide (along with a thick layer of masking tape). While pressing the seams we both held the iron together (with Hanna’s free hand on her knee – to prevent burns). She stitched the blocks into a doll quilt set 3 x 4 and then we layered it with flannel and stitched almost all the way around. Hanna turned it right side out and helped pin the players together. We did some straight quilting lines and, less than 2 hours later, it was finished! Her response: “let’s make another one”! She’s definitely grandma’s girl :-). Oh, how special! Imagine what memories you’ve created for her. She’ll think of this time with Grandma with such fondness. And yes, she’s a Grandma’s girl – she looks so much like you! With two small granddaughters myself, I was delighted with Hanna and her quilt project. Thanks so much for sharing! Precious! Simply precious – – – the Joys of Grandchildren to share our special times with. Good for you. Such a blessing! Good job Hannah and Grandma! I’m showing this to Kelsey to guilt her into sitting still long enough to make something. I can’t think of a better way to spend a cold day inside. Thanks for sharing! Now who is having more fun, Hannah or Grandma? What a beautiful day with a beautiful little granddaughter. Aren’t we lucky to have these little angels? 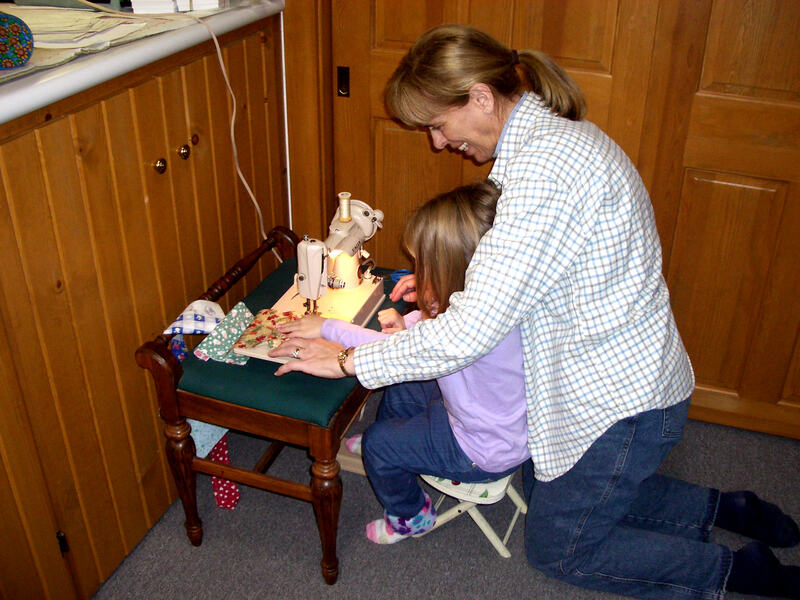 How wonderful that you are teaching your granddaughters the love of sewing/quilting. They won’t forget the memory! When I saw the doll it made me smile. I have saved that exact same doll from my childhood! The only thing that’s different is mine visited the doll hospital 3 times and had two body replacements and one hair replacement so the hair looks different. 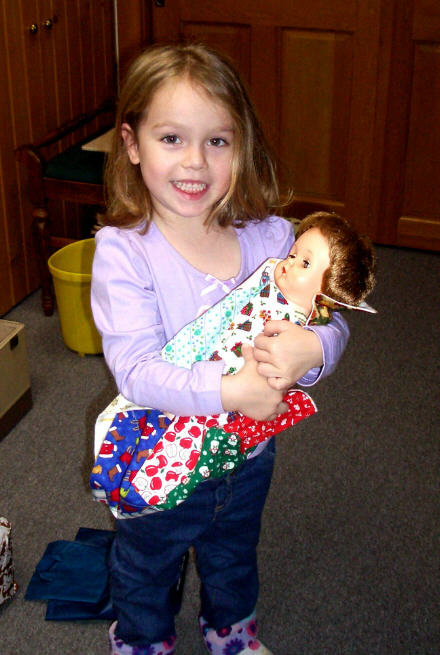 I just wasn’t ready to let that baby go when I was little so she got a makeover from a woman in Madison on Monroe street who actually ran a “doll hospital”. Thanks for the nice post!